We learned that the day before, there was apparently a terrible tragedy in Oslo - a big bomb had exploded and some guy had rampaged and killed like 80 people on an island. 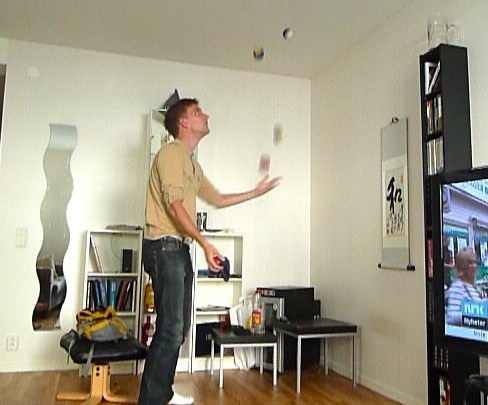 It was surreal to learn this, especially because Lisle had to go to Oslo next. 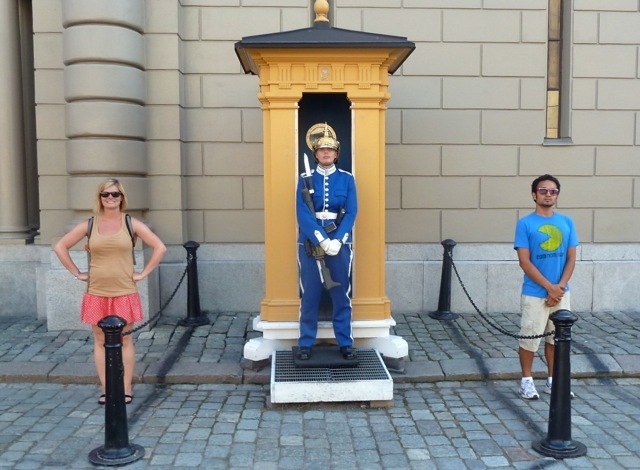 And if things had worked out differently, I could have totally been in Oslo at the time too. But it didn't. And I'm in Stockholm. Next came our quest for IKEA. We went outside to wait for the IKEA bus, and after 15 minutes I realized that it only runs Monday-Friday. Could anything else go wrong?! We went to the tourist information office to ask them, but we had to take a number and it would be like another 45 minutes just to get some service. Lisle went outside to the map store to ask for help, and I found a free internet terminal to research. 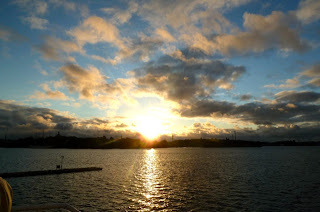 We both arrived at the same conclusion: Take the metro to Skårholmen and take a bus or walk from there to IKEA. It wasn't that hard. So we went ahead. 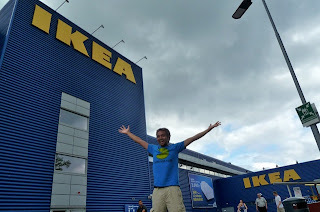 The IKEA in Stockholm is supposed to be the largest in the world, but I don't think it was. It was 4 stories high, with each floor designed as concentric circles. 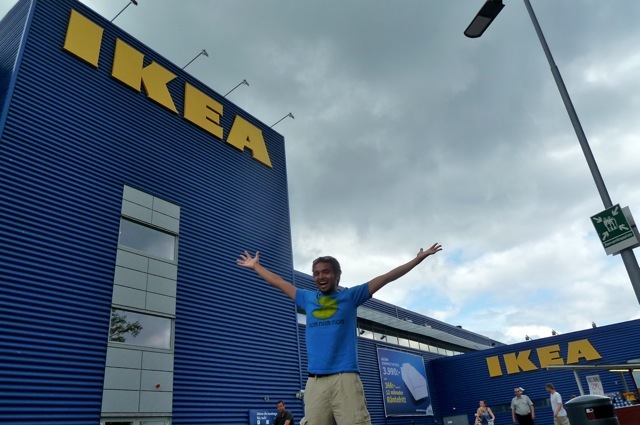 Still, I think the IKEAs that I've been to in the US are still bigger. I felt lied to. Anyway, Lisle and I did our IKEA thing, walking around each floor and sitting on couches. The smell of cinnamon buns wafted toward us and pulled us into the 2nd floor cafe, where we got a coffee and cinnamon bun for 5kr (€0,50). We walked around some more before going upstairs for our lunch at the cafeteria. There was another long line, and we each ended up getting a plate of meatballs. We then left, out to meet our next host (Stephanie could only host us one night). We got lucky and grabbed the next bus back to the metro. The trains here run on the left side of the platform, which I deduced was because they were first built back before Sweden switched from driving on the left to driving on the right. The trains are very quiet and clean, and many of the stations are uniquely decorated (unfortunately I didn't get to see the famous stations hewn into the rock. Lisle and I went to Andreas's place, which is conveniently located right next to the train station Telefonplan. We said hi and then left to explore the city together. 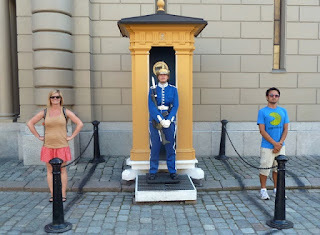 We walked around Gamla Stan (old town island) again, seeing plenty of tourist sights. Stephanie had returned from the airport, where she went after work to pick up her friend visiting from the states. We went back to her apartment and picked up our bags and brought them to Andreas's. We then proceeded to make dinner with him and his flatmate Niklaus. I couldn't stop making fun of the food, since we were making tacos. We then went out. My friend Markus had come to Stockholm to meet up. After some prepartying, we were off. We met three girls on the train - Josefina, Sophia, and Johanna. The plan was to start at an outdoor bar/club called Sommar, but it was past 11 and the entrance fee had gone up. So we went to another bar, Daam, which was cheap and divey! A couple drinks down, and chatting with random Sweden people, and the bar was closing at 1. What? Next stop - Medusa, an underground bar - literally, it's built into the caverns and underground passageways of the old town! I lost the three girls, and Lisle returned home to get some sleep before her early train to Oslo. Markus was crazy, just grabbing drinks from random tables and bringing them to us. We gambled at the blackjack table for a little bit and then left the bar as they shut down. 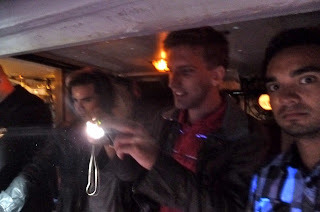 The next stop was Patricia, a big party boat! We got in and continued the night there, well into the morning. I sat on the top deck as the sun rose. We must've been there until 5 or so. Then back to the apartment, where we woke Lisle up just an hour or so before she had to leave herself. The next day, Sunday, was a very down day. For the first time in a long time, I felt sick and slow and hungover. So after waking up around 12:30, I spent several hours on the internet before doing some laundry and watching TV (and old episodes of Friends) with Andreas. We then went out go get some food - kebabs at a great little spot just down the street - and went to a nearby football field where we threw his aero frisbee around for some time. It was chill but a well-needed break from the non-stop life that I've been living for the last 65 days on the road. We ended up watching Limitless before bed.